YERINGTON, Nev. (Reuters) – Once seen as a laggard in the global mining industry, U.S. copper deposits have quietly drawn more than $1.1 billion in investments from small and large miners alike as Tesla and other electric carmakers scramble for more of the red metal. “Fifteen years ago, U.S. mining was thought to be a dead industry, but now it’s a profitable area for us,” said Richard Adkerson, chief executive of Freeport-McMoran Inc (FCX.N). The buildouts are expected to boost U.S. copper production by at least 8 percent in the next four years, according to data from the International Copper Study Group and DBS, with Nevada Copper Corp (NCU.TO), Taseko Mines Ltd (TKO.TO), THEMAC Resources Group Ltd (MAC.V) and Excelsior Mining Corp (MIN.TO) aiming to open copper mines by the end of 2020. The development trend has gone largely under the radar, with copper industry customers like Tesla Inc (TSLA.O) – rather than miners themselves – grabbing the headlines. But that is slowly changing. 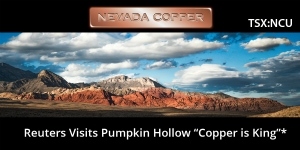 Surrounded by onion farms and backed by the Sierra Nevada mountains, the Pumpkin Hollow mine will produce more than 100,000 tons of copper each year once its underground and open-pit portions fully open, which is slated to happen in phases. Majors Freeport, Rio Tinto (RIO.L) and BHP Group Ltd (BHP.AX) also have U.S. copper projects of their own under development. These come just as copper prices are forecast to rise more than 10 percent in the next two years, according to Canaccord Genuity.